Deposit bonuses are as generous as ever at Intertops Casino this month but all through March players have to find a code hidden in an image on the website in order to get their free cash. The US-friendly online casino is supplying its players with special decoder glasses to help them find the secret bonus code. A new code will be displayed on the site each week through March. The hidden bonus code gives players a 20% deposit bonus (up to $100). (There is a way for players that don’t have the special glasses to locate the code without them and claim a 10% deposit bonus.) Players can order their special code-cracking glasses by writing to casino@intertops.com. Intertops did start as a sportsbook – they took the very first online bet ever. 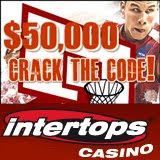 So in the spirit of March Madness, every Monday this month Intertops Casino is giving a $50 coupon to the 150 players that deposited and played the most over the weekend (Thursday to Sunday). Every Thursday, they’ll give $50 to 50 randomly drawn players who made deposits and wagers the previous Monday through Wednesday. The biggest progressive jackpots available to American players are all at Intertops Casino. At over $1.6 million, the Jackpot Pinatas jackpot is the largest jackpot available, but two other jackpots have also reached seven-figures. The Aztec’s Millions jackpot and the jackpot tied to both the Mid-Life Crisis and Shopping Spree slots are all well over $1 million. Intertops Casino features more than 300 instant play and download games including 3 and 5 reel slots, multi-hand video poker, and traditional casino favorites from 3-card rummy to blackjack, roulette and keno. Its total jackpot pool is currently more than $4 million. For more than eleven years Intertops – the very first company to take an online wager – has been the most reliable and trustworthy online casino in the world and continues to uphold its traditions of quick, hassle-free deposits and withdrawals and excellence in customer service.